Cookies for breakfast?! Seriously?! Serious. These amazing cookie dough bites are packed full of nutritious goodness. With wholesome ingredients, these would make an excellent breakfast on the go, (never mind a great replacement for calorie filled, sugary desserts). 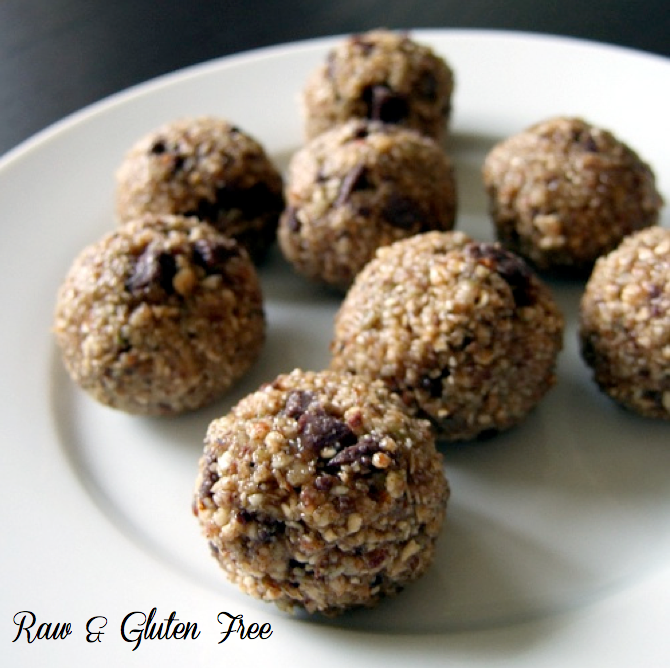 They are not only raw and gluten-free, but are super filling. Did I mention they are actually good for you? Here's the easy peasy recipe! 1. Combine Almonds, Walnuts, Oats Coconut Flakes, Cinnamon, Salt and Protein Powder in a food processor or blender and blend into a fine meal. Remove from blender and place into a mixing bowl. 2. Process Dates, Vanilla Extract, Molasses, and Coconut Milk until smooth. 3. Stir in the the date mix with the almond meal. Add cacao nibs. 4. Grab bite sized amount of "dough" and roll into balls. Place on a cookie sheet and chill in the refrigerator for approximately 30 minutes. You can also freeze them if you like. Voila! Cookies for breakfast... yes, please!